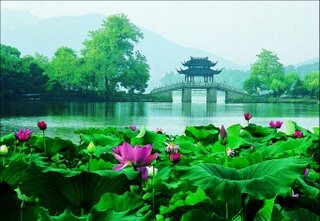 Originally a shallow sea inlet, due to the laying down of silt this 5.68 square kilometers (about 1,404 acres) of water became the famous West Lake. With an average depth of just five feet the lake comprises five distinct sections. 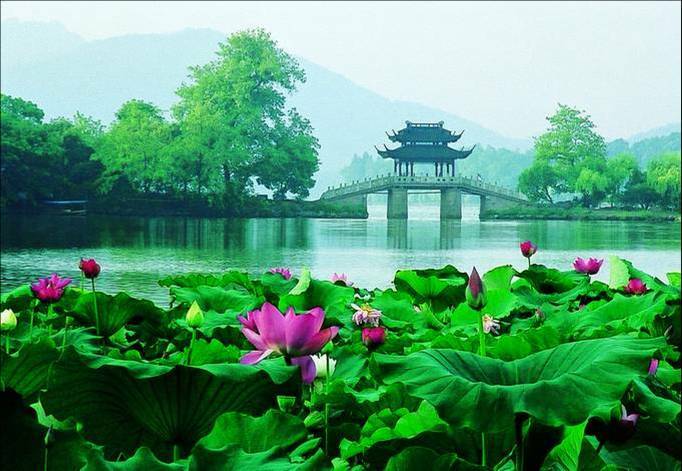 The largest part is known as the Outer Lake and it is bounded by the North Inner Lake, Yuehu Lake, West Inner Lake and Lesser South Lake. Held in the embrace of hilly peaks on three sides, this water wonderland has been an attraction for centuries and it is small wonder that it was a favourite imperial retreat. The lake and its environs have all the elements of a traditional Chinese garden but on a grand scale. The natural setting of strangely shaped peaks, serene forests and springs, dense foliage and a myriad of blossoms especially in springtime are enhanced by a treasury of sculpture and architectural features. Whatever the season, the panorama is pleasing to the eye and the nuances of light shade together with the moods of the weather present an ever-changing picture that justifiably has been described as 'intoxicating'. A number of specific features can be singled out as worthy of particular note. To the south of centre of the Outer Lake is a manmade island known as the Island of Little Oceans, that encloses four small lakes. From here one can view the Three Pools Mirroring the Moon when at night candles are lit in stone lanterns jutting out of the water thus creating the impression of the reflections of three moons. The scene is truly magical on the night of the Autumn Moon Festival. Solitary Hill Island lies between the Outer Lake and the north Inner Lake and is an ideal spot from which to admire the vista. The nearby Two Peaks Embracing the Sky is another impressive sight, especially when crossing the lake by boat. 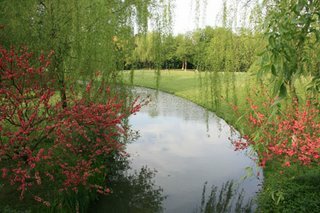 Near to the lake can be found the Ling Yin Temple in its woodland setting near to Fei Lai Feng (Peak Flown From Afar). Legend has it that this limestone peak flew from India where it had formed part of a holy mountain. These are of particular interest to Buddhists and those who have a love of sculpture and art. The Mausoleum of General Yue Fei is a monument to the patriot who was murdered in 1141 at the behest of his archrival Qin Hui, the Song prime minister. These buildings like others in the vicinity of the lake such as the slender Six Harmonies Pagoda add to the calm and beauty of their surroundings.